Dovyalis. Flacourtiaceae. Fifteen species of dioecious shrubs or small trees, sometimes with axillary spines. Leaves alternate, simple, pinnately veined, usually 3-nerved at the base, with a short petiole and small deciduous stipules. Male flowers many, clustered in the axils, with 4-7 hairy sepals, no petals, and numerous stamens and glands bourne on a fleshy disc; female flowers solitary or a few together, with 5-9 peristent hairy sepals and no petals; ovary 2-8-celled. Fruit an indehiscent berry. Africa, India, Sri Lanka. Dovyalis caffra, from warm coastal habitats, is a vigorous, drought-resistant species once established. It is grown for its aromatic fruits, which have a flavour similar to apricots, eaten bletted or in jam. The dense, spiny shoots make an impenetrable barrier, and it is well suited for hedging in zones that are frost-free or almost so. In climates with hot summers, where wood becomes well-ripened, Dovyalis caffra, with tolerate temperatures to between -5ºC and -7ºC. Dovyalis hebecarpa and Dovyalis abyssinica (the latter possibly the most ornamental of the genus) occur naturally in warm, humid and subtropical climates and in temperate zones are grown in the warm glasshouse, with a winter minimum of 7-10ºC. Plant in fertile, humus-rich, well-drained soils in full sun. Space Dovyalis caffra at 1-1.5m for hedging, 4-5m for fruit trees; a ratio of 1:30 male to female plants is adequate to ensure pollination. Propagate from seed; plants will fruit at 4-5 years of age. Also by layering. Graft or shield-bud desirbale varieties on to seedling rootstocks. Shrub to 3.5m, with or without spines. Leaves to 8cm, ovate, glabrous, glossy, light green. Flowers inconspicuous, green. Fruit globose-ovoid, 2.5cm diameter, with the colour and flavour of apricots, containing a few small seeds. Ethiopia. Z10. KEI APPLE; UMKOKOLA. Vigorous shrub or small tree to 6m, with spines. Leaves to 6cm, often crowded at the bases of the spines, oblong-ovate, glossy, entire. Flowers inconspicuous, green or yellow. Fruit spherical, to 4cm diameter, bright yellow, smelling like apricots, the pulp juicy, with five or more flattened seeds. S Africa. Z9. 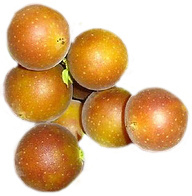 KITEMBILLA; CEYLON GOOSEBERRY. To 6m, with long sharp spines. Leaves to 10cm, lanceolate to ovate, acute, pale green, entire or slightly toothed. Flowers inconspicuous. Fruit 2.5cm diameter, maroon-purple with sweet purple pulp tasting like gooseberry. India, Sri Lanka. Z10.